I've got a photo of the poster at our Game Gallery. "And so I found myself learning about a folk that I had never heard described even in rumors. These halflings are an ancient people - in fact, they gave me a new definition for 'ancient.' Their race is older than any other on Athas. They remember times before the Warbringer, before magic, and before the advent of the Way. To the west of Tyr, the proud strongholds of the Jagged Cliffs defy everything that is known about Athas. The history of the halflings who live there is as old as Athas itself. Their origins lie with the rhulisti, who were masters of the world during the Blue Age - and who caused the end of an age when a simple experiment went horribly awry. 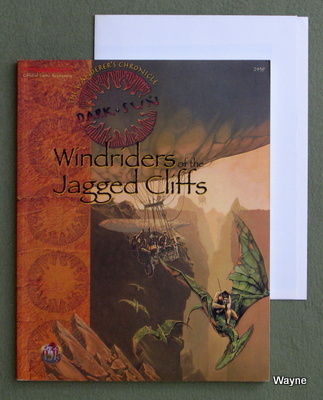 Windriders of the Jagged Cliffs details the lives of the rhul-thaun -- the descendants of the rhulisti and the keepers of ancient knowledge who practice the most unusual and arcane art under the crimson sun: the shaping of life itself. • Details of the Jagged Cliffs region, the rugged land that lies between Tyr and the Kreen Empire. • Living tools left from Athas's dim past, including organic weapons, armor, and flying vehicles. • Secrets of the swamp at the base of the Cliffs, and its link to all magic within the world of Athas. • Details for creating these unique halfling characters, and rules for making and using living weapons. • A complete adventure for existing PCs or newly created rhul-thaun characters. 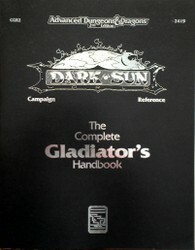 "From the dusty arenas of Athas comes The Complete Gladiator's Handbook, ready to arm the fiercest DARK SUN® campaign antagonist. Numerous new kits, details of the Tyr region's arenas, quick summaries of combat rules, a martial arts system, and suggestions on how to run arena games are within these pages. So gird your weapons — your opponents await!" 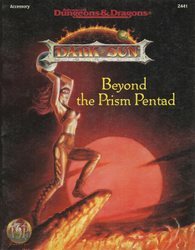 "If you're intrigued by the world of Dark Sun, you need this book... it details the most colorful, exciting, and powerfully unique character class of that universe, the Gladiator. Chapters include: gladiator kits (including the Beast Trainer, Blind Fighter, Reaver, Gladiatorial Slave, and much more), armor optimization (perfect for any campaign! ), new weapon proficiencies, martial arts and exciting new combat rules for desperate hand-to-hand struggles, the Arenas of Tyr, designing a Gladiatorial campaign, tournaments, and more... this flexible combat system is so wonderfully detailed and yet approachable that you'll find yourself wondering how you ever role-played Fighters without it. Ideal!" ...from Amazon reviewer "darkseraphim"
"In the deserts and cities of Athas, the most dangerous weapon is the mind. With a thought, deadly mindbenders can shatter stone, bend steel, or break opponents. Thousands of Athasians possess wild psionic talents, but only a select few can master the Way and call themselves psionicists. 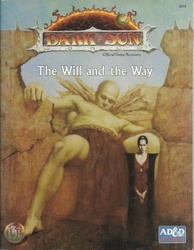 The Will and the Way is not just for DARK SUN campaigns. As a companion volume to The Complete Psionics Handbook, the new powers and rules expansions contained in this book can be used in any campaign." Thri-Kreen of Athas enters the world of the nomadic thri-kreen - a world governed by tokchak, the clutchmind, and tikchak, the hunt-mind. From hatching to hunting to coming of age, the secrets of the thri-kreen are at last revealed. From their formidable combat abilities to the subtleties of their psionic powers, this accessory explores every aspect of thri-kreen life. 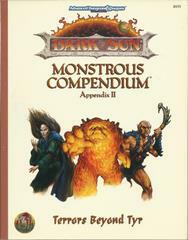 For players, there are new rules and new character kits - offered to DARK SUN game characters for the first time! A special adventure for thri-kreen characters, The Taste of Fear, is included. Dire events in the unknown North trigger ancient racial memories. What terrors lie in the lost secrets of their past?" The Dragon of Tyr is gone, his evil scattered on the scalding winds. Torrential rains fall over the Sea of Silt, spinning off deadly storms that can strike anywhere in the Tablelands with only a moment's notice. Violent upheaval rocks the city-states of Raam, Draj, and Balic after the deaths of their sorcerer-kings. A new age has dawned on Athas, but will it be an age of restoration—or of destruction? • The key events of the first 10 years of campaign time, with a detailed timeline of historical events. • Updates and details on the changes in the world, including the seven city-states of the Tyr Region. • Statistics for the major personalities, including Rikus, Sadira, and the remaining sorcerer-kings. • A short adventure to tie player characters into the events of the climax of the Prism Pentad series. What forces have seized control of Raam and Balic? Who is the real power behind Draj? How are the citizens of iyr handling their second decade of freedom? The answers to these questions — and many more — are awaiting you." Beneath the crimson sun, the life of a wizard is hard and dangerous. Blamed for the conditions of the world, feared for the mysterious power they wield, and hated for crimes both real and imagined, Athasian wizards walk in the shadows of civilization and in the barren wastes of the wilderness. For to reveal their nature is to admit their crime -- and risk their very lives. 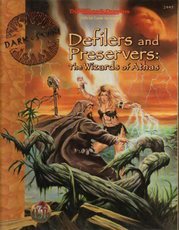 Defilers and Preservers: The Wizards of Athas details the two paths of magic in the DARK SUN campaign and the strange way magic works there. 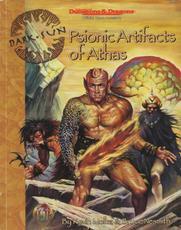 It demonstrates how Athasian wizards power their magic and describes both types of wizards - defilers and preservers. Defilers leech energy from the land, stealing life away with every spell they cast and leaving only dead ash behind. Preservers also gather energy from the land, but they take only what they need and work to keep the world healthy and alive. These two mortal enemies stand locked in a never-ending battle - with the survival of Athas at stake. • A discussion on Athasian magic - how it works, who can use it and what it can do. • New rules for Athasian wizards. • New proficiencies and plenty of wizard character kits. • Rules for the advanced beings - dragons and avangions. • Information on three new types of defilers and preservers - ceruleans, necromancers, and shadow wizards. "'Life-shapes are the wondrous tools of out ancient past. They are our heritage, our birthright. Cast off the dead. Use not the unliving tool. Our ancient glory can only be restored by embracing life, not death. • Dozens of artifacts from the Prism Pentad series of novels, detailed here for the first time. • Mysterious life-shaped items - living items from the Blue Age of Athas. • Dozens of new magical items unique to Athas. • Random power tables for creating your own DARK SUN artifacts or customizing the ones in this book. • Expanded and revised DARK SUN magical item tables." CREATURES: Animal, Household (Hurrum, Critic, Renk, Ock'n); Animal, Herd (Kip, Z'tal, Jankz); Antloid, Desert (Dynamis, Soldier, Queen, Worker); B'rohg; Banshee, Dwarf; Beetle, Agony; Bog Wader; Brambleweed (and Tree); Burnflower; Cat, Psionic (Tagster, Tigone); Cha'thrang; Cistern Fiend; Cloud Ray; Drake, Athasian (Air, Earth, Fire, Water); Dune Runner; Dune Trapper; Elemental, Athasian (Greater Air, Greater Earth, Greater Fire, Greater Water, plus Lesser versions); Erdland; Esperweed; Flailer; Floater; Giant, Athasian (Desert, Plains, Beasthead); Golems, Athasian (Ash, Chitin, Obsidian, Rock, Sand, Wood); Halfling, Renegade; Hej-kin; Id Fiend; Insect Swarm, Athasian (Locusts, Mini-Kanks); Kank, Wild; Kirre; Megapede; Mul, Wild; Nightmare Beast; Plant, Carnivorous (Blossomkiller, Dew Fronds, Poisonweed, Strangling vines); Pterran; Pterrax; Pulp Bee; Pyreen (Peace-bringers); Rasclinn; Razorwing; Roc, Athaisian; Sand Bride (Sand Mother); Sand Cactus; Sand Vortex; Scrab; Silt Horror; Silt Runner; Sink Worm; Sloth, Athasian; So-ut (Rampager); Spider Cactus; Spider, Crystal; Spirit of the Land; T'Chowb; Thrax; Villichi; Zhackal; Zombie Plant. 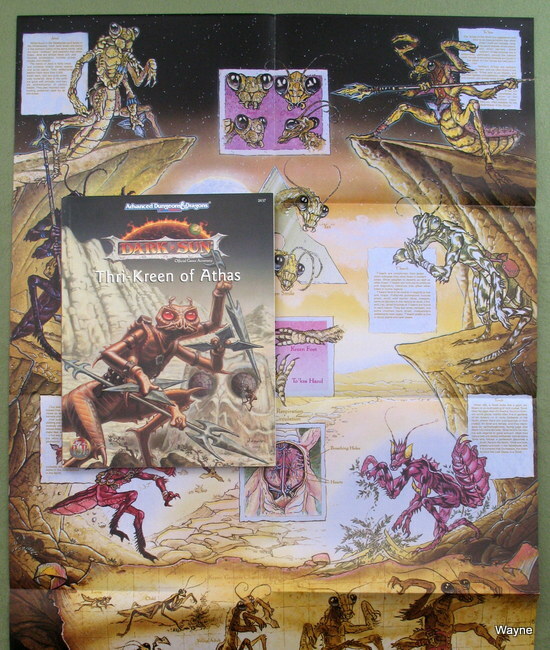 "Beneath the blistering rays of the Athasian sun live creatures more horrible than anything yet found in the AD&D game. In this harsh world, only the strongest can survive. Even the most timid looking creatures must be ready to kill or be killed at any time. Terrors of the Desert contains 96 pages of new monsters specially designed for use in the DARK SUN campaign setting. Within these pages you'll find a variety of monsters, many with unbelievable psionic powers. Terrors of the Desert includes details on the massive creatures that lurk beneath the Great Silt Sea, powerful elemental beings unlike those found anywhere else, and golems of ash, chitin, and obsidian." Only the bravest -- or the most foolhardy -- would dare stand before the creatures included inside this MONSTROUS COMPENDIUM appendix. Encounter the shadow giant, the stalking horror, and the unique undead found lurking beyond the Tablelands as well as many other terrors. 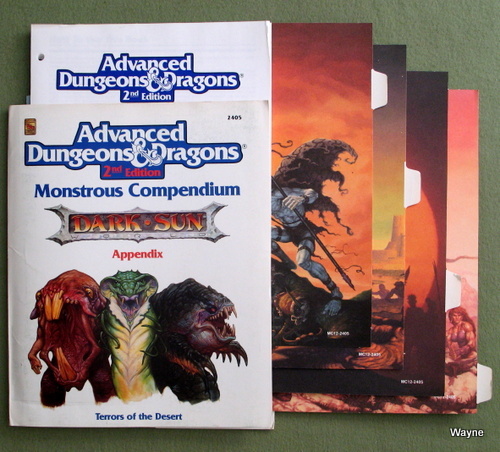 Containing 128 pages of full-color monsters, this accessory is designed for the DARK SUN campaign world but is adaptable to any AD&D campaign."